An event unmistakably immersed in the glamour and pomp that Formula 1 aspires to capture with every trip on the premier open wheel racing tour, the Monaco Grand Prix has been since 1929 as one of the pinnacle events in motorsports. Manoeuvring the tight streets of the 2.075-mile (3.340-kilometer) circuit de Monaco, the unpredictable 2012 Formula 1 racing series braces for 78 laps for Sunday with the three-session time trial Saturday. On the initial Q1 session, Nico Hulkenberg with his Mercedes-Benz powered Force India race car was at the top of the time chart. Hulkenberg’s lap time of 1 minute, 15.418-second, the Force India lead race car would later just miss the cut for the Q3 top-10 placing 11th in Formula 1 qualifying. The Q1 session was marred by the crash of Sergio Perez’s Sauber-Ferrari. “I was on my first lap, so was not pushing a lot.” said the Mexican driver who has been wearing a special helmet at Monaco honouring Roberto Gómez Bolaños. Perez went on to detail the incident by saying, “I went into the tunnel and had a lot of understeer and then I went into turns 13 and 14. Thirteen was quite fine but in 14 I just went straight and didn’t get the car to turn.” Colliding with the retaining barrier, Sergio Perez was sent to a nearby hospital. Medically cleared for Sunday’s race but unable to post a qualifying lap, Perez and the Sauber F1 team will have to rely on the race’s stewards approval to run. The second Sauber-Ferrari piloted by Kamui Kobayashi will start in 12th for the team at Monaco. Felipe Massa took the Q2 session of Monaco Grand Prix qualifying by entering under the 1-minute, 15-second lap time range. Driving his Ferrari to a 1-minute, 14.911-second lap around the Circuit de Monaco, Massa was more than a tenth of a second faster than the Mercedes GP car of Nico Rosberg. In the final Q3 session at Monaco, the Mercedes GP cars came to life. 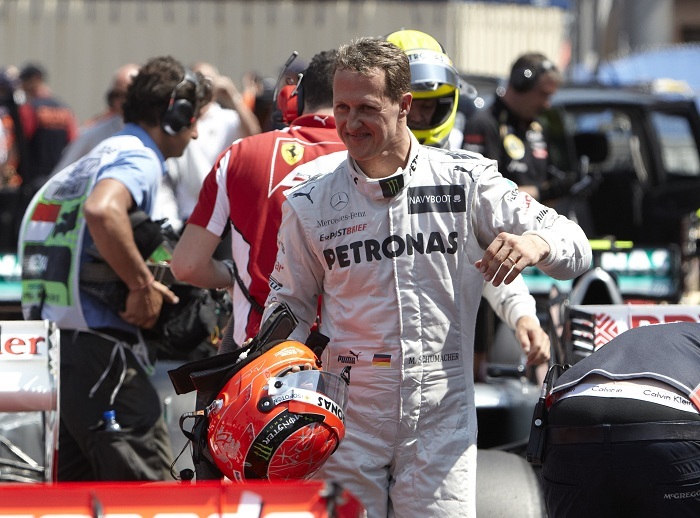 At the top of the qualifying time sheet, Michael Schumacher claimed his 69th career Formula 1 racing pole. Performing a 1-minute, 14.301-second lap, Schumacher outran the Red Bull-Renault of Mark Webber by 0.080 seconds on Pirelli supersoft slick tires. However, due to a penalty during the last Formula 1 race in Spain, Michael Schumacher will be serving a five-grid position drop down the field. “It is simply a wonderful feeling to set pole after such a long time, and particularly here in Monaco. Okay, it has taken a little bit longer than I might have wanted in the second chapter of my career, but that makes it even sweeter. It’s just beautiful.” said Schumacher simply embracing his first qualifying triumph with the Mercedes GP team. “We already thought that this circuit should suit us, and it’s the perfect confirmation of all the work from every team member in Brackley, Brixworth and Stuttgart - a big thank you to every one of them, because this is a team result. Of course, it’s unfortunate that I won’t start from the very front but that’s how it is. I will do as well as I can. We know that overtaking is tough but with DRS and KERS, you might as well try it - and you can be sure I will.” declared the German driver. Promoted to the preferential starting spot, Mark Webber will try to re-establish an effort that resulted with the 2010 race victory. Webber’s teammate Sebastian Vettel did not mount a Q3 qualifying effort and will start 10th. Red Bull Racing has won the past two Monaco Grand Prix events. Nico Rosberg’s Mercedes GP car will be starting alongside Mark Webber itching to recapture the top spot once the lights go out to commence the 2012 Monaco Grand Prix. Mercedes-Benz will also have the added effort of McLaren in the second row of the race as Lewis Hamilton will start third. Hamilton’s row of the grid will also feature the Lotus F1 Team’s Romain Grosjean. Fast throughout the weekend in Monaco, Grosjean first serious Formula 1 campaign has been one of great progress. Romain Grosjean’s fourth place starting spot while Fernando Alonso's Ferrari will be the last spot ahead of the pole-winning entry Michael Schumacher. A race set 2pm local time (8 am Eastern time), the Monaco Grand Prix will start Sunday with a possibility of light rain. Michael Schumacher will serve a five-grid position penalty. Pastor Maldonado will serve a ten-grid position penalty as a result of a practice incident at Monaco.